I was diagnosed with type one diabetes last year. I shook it off at first, not really understanding the disease, and mistakingly thinking that like Type 2, I could cure the disease with exercise and diet. I didn't yet know that T1 is autoimmune and like lupus, has no cure. But now I know how jarring it is, to poke myself 5-6 times a day and give myself injections in my belly, thighs, and arm, every time I eat. It is much scarier than I imagined! On Sunday, I'll be in Seattle, raising money for a cure— not only for myself but for the millions Type1/ juvenile diabetes affects. We will walk through the city, and prove to ourselves and to our friends and family that we are stronger than our disease. Because no more children should lose their health and innocence to this blood-sucking disease. No child should go to bed afraid that they will lapse into a diabetic coma while they are in a deep sleep. It's time I stood up and shook my syringe at it in rage. It's time to realize what a life-changing diagnosis this is for kids and their families, and how badly we need a change. 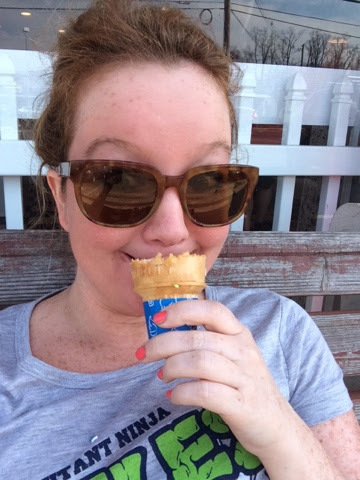 This lady who are eating that ice cream. She is now suffering from diabetes but she need to care from these edduson food. Which was not good for her when she get health more in that time she can eat more food.